I love it when I can tell a good story on this site. As I write this piece I feel a sense of jubilation which is as real as it is ridiculous. This post is about solving a mystery - putting my mind to rest about something that has played through it for more than thirty years now. If you were hoping for something deep and meaningful, you might want to click elsewhere now because this post is not about life, love, the workings of the female mind, scientific discovery or self-actualisation – it’s about lolly sticks. Seriously it’s all about lolly sticks but not just any lolly stick – the Lyons Maid Superman’s Superheroes lolly sticks. If you were a child in the seventies you will know what I am talking about and you really must read on. As a child growing up in seventies Bletchley, the arrival of the ice cream van was an important event – something that would distract one from whatever else was occupying the mind at the time. Back in those days though the arrival of the van didn’t guarantee a purchase, money was tight for my parents and that was that. But the outcome of the begging effort wasn’t always ‘no’ however, even when it was ‘yes’,the van’s menu of colourful Lyons Maid ice lollies was compelling and tough decisions awaited the inevitable throng of kids. For me, for a while, the decision was easy – it had to be the cola flavoured Superman lolly. Why? Because the lolly was great but the stick it came on was even better. The sticks featured DC Comics characters and heroes and villains were equally represented. In theory you could paint them but I never knew anyone that did. As a child I treasured these sticks and kept them with the fervent hope that I’d complete the set - although at the time I didn’t know how big the set was. I even ate the lollies carefully to ensure that the stick was free from tooth mark damage. My friends and I would trade characters and I’ll even admit that I used to keep my eyes on the ground when out playing just in case I found a stick that someone else had discarded. Finding one was a triumph worthy of celebration. I kept my sticks in a round purple shortbread biscuit tin that also housed all the cigarette and tea cards that my grandparents used to collect for me. I never got close to having the full set of sticks but hey there was nothing unusual in that – I never had the full set of anything and not that many toys either for that matter – but more of that later. 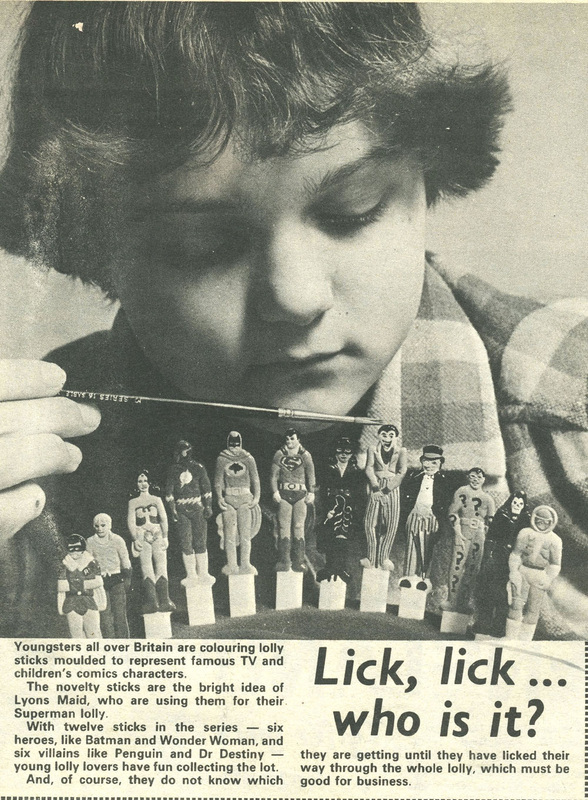 In compiling my seventies stuff gallery, the subject of the lolly sticks popped back into my head and so I decided to do some research to try and fill the gaps in my understanding. How many sticks were there? Which DC characters were represented – important stuff! The efforts that the authors have gone to in order to compile the site is significant and I recommend that you visit and take a look around. I found a small image showing 12 sticks but it was too small to make out the essential detail. The site’s editors did however leave contact details so I got in touch to ask for some help. And Peter Bird, to whom I am very grateful, stepped up almost immediately. social networking at its best. For over thirty years I didn’t know and now I do – and it feels good too! Something so small that it should be completely irrelevant in my busy life, has in fact made me genuinely happy. Happy enough to feel inspired and then to write and to share this article with you. Bizarrely the one thing that would make me even happier would be owning a complete set of these sticks and being able to show them to my children. And that’s ridiculous because I am a grown man with a family, mortgage and far more possessions than I need. How could I possibly want some strips of white plastic? I do though and if you can help, please get in touch. The title of this piece included the word psychology and even though I suggested early on that it would lack intellectual weight, I will now delve into some much more cerebral matters. I think that the lolly sticks, or to be more accurate the loss of them, actually influenced my personal/emotional development. These days one of something is never enough, everything comes in sets and it drives Mrs Baldwin mad. Sets need to be complete too! I am a collectormaniac (I made that word up). I have even gone to great lengths to complete my children’s sets of things as well – and often they don’t even care or appreciate the effort. Heavy stuff! And it all ties back to Superman lollies and so this piece is genuine lolly stick psychology. No over-emphasis after all. I am probably mad and should probably seek some professional help. Rest assured, when I do, I’ll write about that too. Watch this space. *P.S. Just in case he reads this and is upset by it, I need to state that I love my dad dearly and he’s a thoroughly decent and likeable chap too. To be honest, I have broken, or lost, loads of his stuff over the years – in fact the last thing just a few weeks ago. He reminds me about some of the more precious things from time to time too so in the spirit of balance, I’d like to apologise for the school scarf, the Peter Storm floppy hat and granddad’s penknife. Kids eh! I have attached a picture to show readers the unpainted sticks that I could find useable images of. If you have images of the Riddler, Joker or Aquaman sticks please send them on and I’ll update the post.